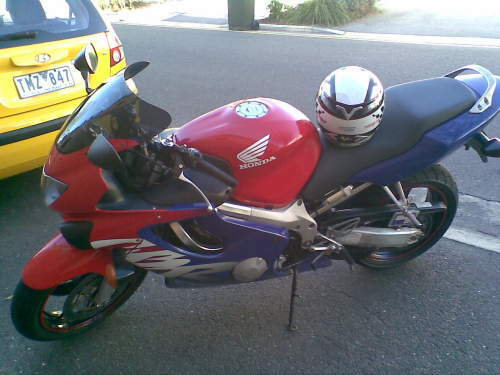 This Used HONDA CBR600F motorbike for sale G�Day guys, You are looking at a 1999 Honda CBR600F in red and purple. The bike is in great mechanical condition and just done 29300 Kms. The bike has got couple of scrathces on the left hand side of the fairing that cant be easily noticed and easily fixed. It has also got tiny scratches on the engine cover too. The front break lever is a little bent outwards but works properly without any problems. It has a black tinted screen and a staintune muffler. It is registered and completely legal. The bike has got bridgestone tires and have got heaps of tread on them. It rides like a dream. I owned this bike for the last 5 months and only ridden less than 1000km. The bike was only used as a commuter to and from work. It has not been raced. The reason i need to sell this bike is because i have to apply for my visa and need money for it. I am definitely looking for a QUICK sale and hence the low price. You will not find a better price for a bike like this. I will only entertain genuine buyers and please no tyre kickers!! First to see will buy it. I am asking for $5000. Thanks for taking time to look at it.